When you stop to consider the age of the Pokemon series, and its far-reaching presence on so many different platforms, it really is surprising that it doesn't have a larger presence on iOS, all things considered. 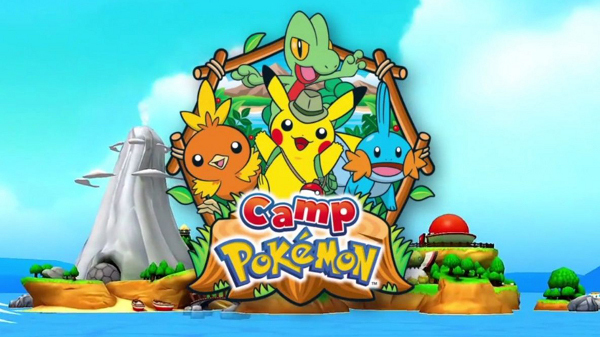 Created for kids, Camp Pokemon offers the opportunity to play a variety of mini-games, collect Pokemon pins and stickers, and use its built-in camera feature to take snappies with your favorite pocket monsters! The game is organized as a destination-based play that takes place on a 3D island, with players navigating via the touchscreen (naturally), and working their way through the game via a guided experience provided by a pair of uniformed human hosts. Thanks to the guides even younger players will find the game very accessible, and the combination of timers and scoring means that older tweens and teens will also find the game fun and entertaining. 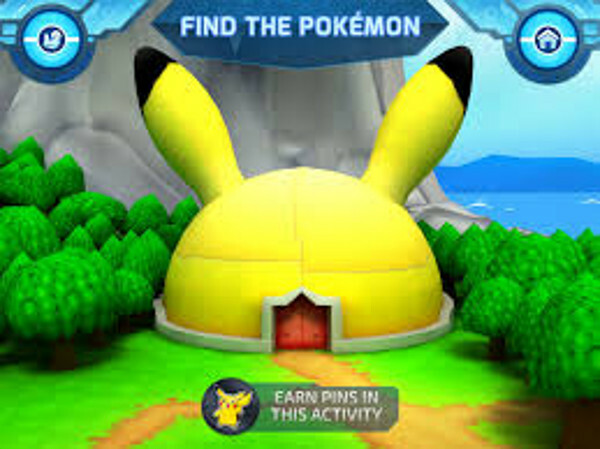 As Camp Pokemon comes from Nintendo - and The Pokemon Company - while it is a low-impact romp, it is also a free app game with no advertising, which is about what you would expect from Nintendo. At the present time there do not appear to be any in-game purchases for this title - that could change in the future, but we suspect not. The only advertising in the game is found on the News Page in the player's home in the game, where they can tap on links to online official Pokemon content. ARENA - The Pokemon Alternate Reality Exploration and Naming Area - a collection of environments in which the player searches for and identifies Pokemon while playing against a timer. The faster you are at finding all six Pokemon, the better your score and result. Each Pokemon found and ID'd results in the award of corresponding collectible pins for each. Battle Matchups - an arena that the player can visit to test their Pokemon knowledge as to Pokemon types. As different Pokemon float past on the river, the player must choose the Pokemon type that is strong against the type floating past on innertubes. The game sessions are timed, and include rewards as well as Reward Pins. Pokemon in Focus - a mini-game in which the player sits around the campfire and IDs Pokemon based on their shadow. Pokemon Evolutions - In this mini-game the player is shown slices of different evolved form of a Pokemon line, and must choose which of the three Pokemon shown the evolutions belong to. Like the other games, the idea is to get as many right as you can manage, the target number being 15 or more correct choices to unlock all three pins. Poke Ball Throw - In this mini-game six different Pokemon wander across the screen and the player must toss Poke Balls at them. 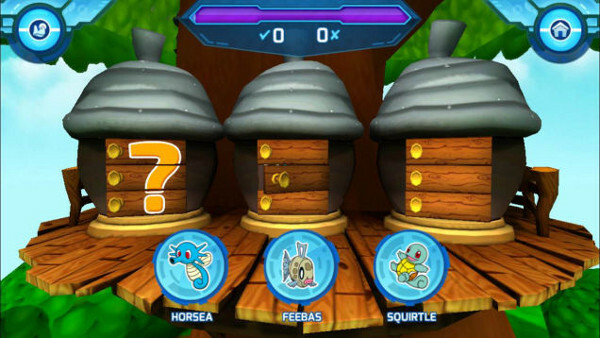 To capture (collect) them, the player needs to hit each Pokemon three times. This is one of the games in which the player collects individual Pokemon pins as well as Reward pins. Mystery Cave - Once you unlock the full evolution of a Pokemon, you gain access to the Mystery Cave to see the Mega-Evolution for that Pokemon - and you get a special Mega-Evolution Pin for your book. At the top of the screen is a Home Button that will instantly take the player to their home in the game, where they can review their accomplishments. That includes their photo album, pin and sticker collection book, and Rewards pages. The graphics in the game are actually better than those of the main series on DSi / 3DS - at least with respect to the realism, as the humans look human. That said, they are not really up to the same depth as the main game series, as they tend to be limited animation imagery, rather than fully animated. The game includes a mixture of background sounds and music as well as music for each of the games. 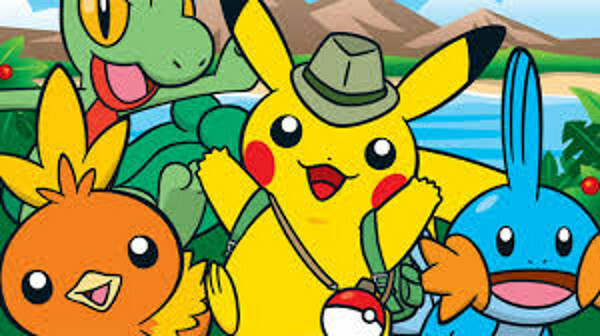 Unlike the main game series, which features theme-based music in kind with the show, the sound effects and music for Camp Pokemon appear to be unique to it. Camp Pokemon was clearly created with younger gamers in mind, though any Pokefan is going to enjoy playing to to one degree and another. The depth of play is not so deep that it will end up being an addiction - unless you know, your gamer really is a serious Pokefan. That said though, the game has the sort of game play that is very appealing for the younger gamer - put it this way, if you are used to your young gamers going back to the same games to play them over and over again - like they do with the cartoons that they watch - this game will offer the same type of draw and experience. The price is right, and you cannot hardly go wrong when Pokemon is involved!